FA1234 | HFO1234YF Recover/ Recycle /Recharge - CPS Products Inc.
• Fully automatic operation of recovery, recycle, evacuate, air purge and recharge. 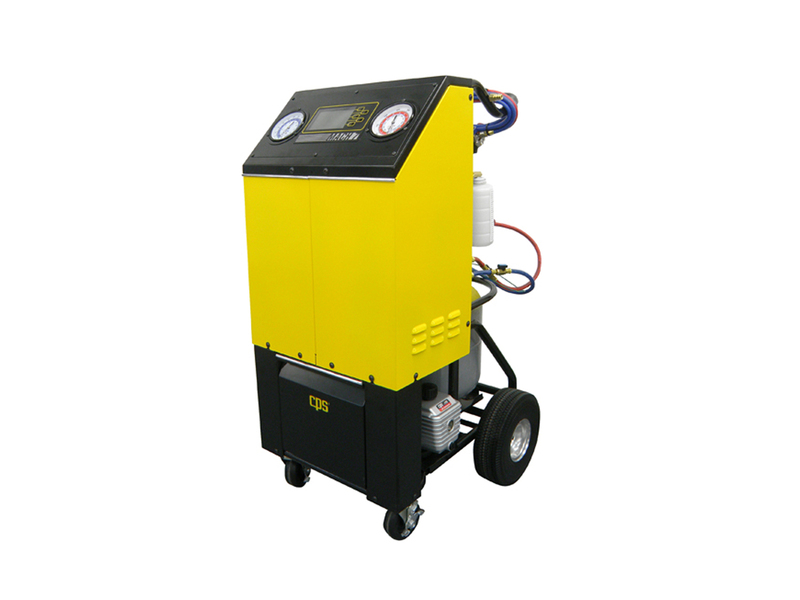 • Complete with a 6CFM vacuum pump capable of dehydrating the system to 50 microns. • Utilizes state of the art microprocessor controlled ball valves in place of solenoid valves making the unit impervious to common containments and sealants. • Easy to program with simple command based LCD display that can set up for five languages (English, French, Spanish, German & Chinese). • Highly visible 3 ½” gauges for high and low pressure. • The FA1234YF can be programmed for both 50LB and 90Lb Tanks. • Comes complete with a 50LB DOT Tank, 8 foot hoses and couplers. • The FA1234YF is completely assembled, take it out of the box, add refrigerant and GO. • The FA1234Y can charge from high side, low side or both. • 115 Volts, 60 HZ, Single Phase, PSI, BAR, KPa, gauges. No longer available for sale in the U.S. market.